An OPK source has told ITAR-TASS the next Bulava SLBM test is expected in the first half of September. The source said the state commission investigating the last Bulava failure is scheduled to meet 6 September, and the launch window for the next test opens on 9 September. A missile industry source told Interfaks the commission will meet in the 5-7 September timeframe, and it could fix a launch date sometime at the end of the first ten days of September. 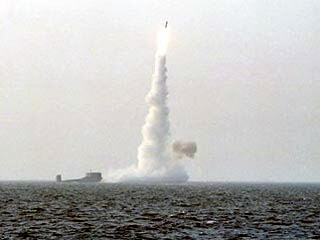 Newsru.com recalled that three tests are planned for 2010: two from Dmitriy Donskoy and one from Borey-class SSBN Yuriy Dolgorukiy. The website’s Defense Ministry source unofficially repeated claims that, if all three firings are successful, the Bulava will be accepted into the armaments inventory next year. This entry was posted in Defense Industry, Naval Modernization, Strategic Forces Modernization and tagged Borey, Bulava, Dmitriy Donskoy, OPK, Sevmash, SLBM, SSBN, Yuriy Dolgorukiy. Bookmark the permalink.